This page shows 2 of the graphite drawings on paper from a collection of 81. The book is a narrative conveyed in pure visual language. The chronologically ordered pages each reads differently from one reader to another, from one time to another, and thus creates a flow and a narrative unique to every read. The fluidity within makes the experience - about seeing - one of a kind. 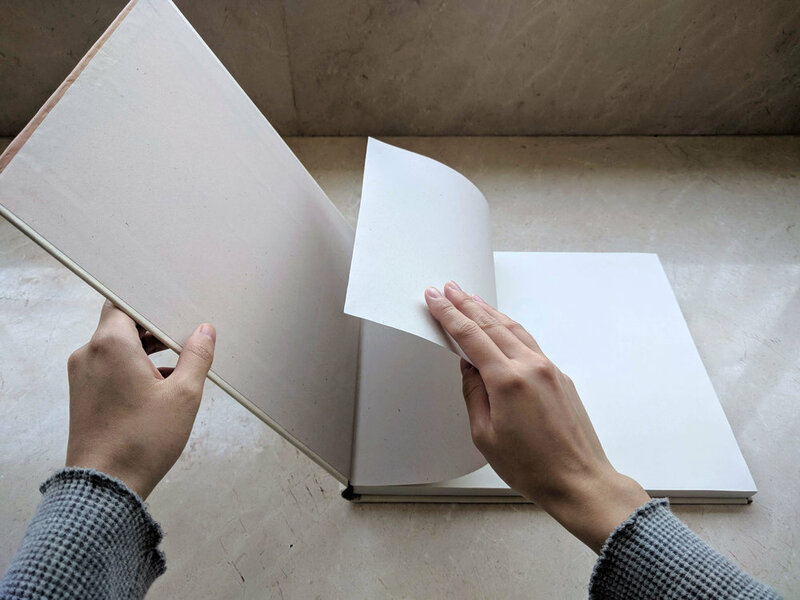 The book set, hardcover or paperback with slipcase, is published in a limited edition of 81, with each hand-crafted by the artist. 11 x 12.5 x 0.75 in. Book opens flat. Perfect bound book block, case bound cover in cream washi with beige vegetable-tanned leather foredges and headbands, textured washi wrapping paper in earth tone, hemp book ribbon. Back cover is an encaustic drawing with sticker decoration, titled 枯 蘭 Wilting Orchid.